Every business, in order to maintain its growth, needs to include a right staffing level. However, it can be a challenging task if not done in an organized way. Whereas hiring too many employees will lead to high costs, hiring too less people will lead to less productivity as the huge burden on the limited number of employees will make them feel stressed and overworked. So, all you need to do is maintain a proper balance in order to develop an effective staffing plan for your business. A staffing plan takes into account all the staffing recruiting needs of your organization. No matter what resources you are lacking, you must focus on creating a staffing plan for your business. A staffing plan is developed to ensure the availability of sufficient staff with the required skills as well as experience. A well-organized staffing plan ensures a successful project completion. A staffing plan provides effective guidelines following which a business can effectively choose, train, and manage its staff. A business, by means of a staffing plan, can easily identify the staffing needs of the company. Moreover, the plan allows the business leaders to identify the type of employees that will be suitable for the different vacant positions. The plan also elucidates the right path that is to be followed for interviewing, hiring, and training the staff. The plan, apart from considering the appearance of your organization currently, will also focus on the appearance when enforced all the possible critical functions. Having a well-organized staffing plan will not let you face any unexpected circumstances and will assist you in handling those situations quickly. Follow the steps below and ensure the success of your organization by hiring the best of staff which you find suitable for your requirements. 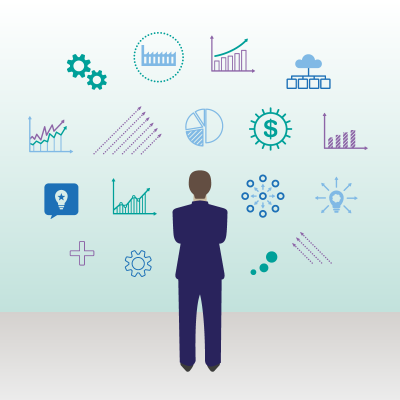 Begin by gathering the statistics related to the productivity of your existing manpower. Keep track of accurate statistics and use them to reward best employees and to create effective training plans. Moreover, the statistics will also help you identify the issues in the production process if any. Now is the time to use the statistics that you have gathered. Use them to find out the efficiency of the average workers in every working hour. However, you must measure the efficiency according to the type of business you are dealing with. For instance, a call center related business would include the average number of calls made by each employee. On the other hand, if it’s a factory, you must take into account the number of average employees on the line. Related: How to Choose a Staffing Company? Analyze your company’s statistics and determine your needs during the busiest season of your business. Though a company faces different challenges in different seasons of a business, you must consider your business requirements during the period of the year in which you expect greater sales. Take into account the highest staffing level that you will need at that particular time. The next step is to determine the number of employees required during the busiest period. 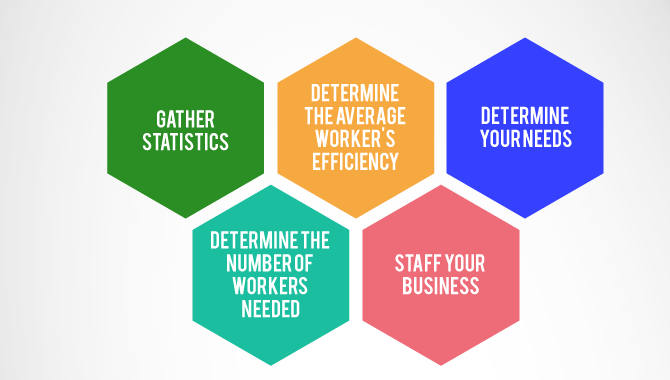 You can do so by dividing the number obtained from the highest staffing level by the average productivity number. A result is a number that you can consider for the training of new employees. All your new employees will take some time to speed up the process and will provide more productivity only after gaining some experience. Related: How to Develop Staffing Strategies That Work? Lastly, come up with a plan to ensure that your business, during peak times, must include sufficient employees to accomplish your requirements. However, you must not ignore the situation when your business goes back to the normal sales. In this case, you might not require too many employees to work with. This is the time when a staffing process can help you by providing you with temporary or contract employees. Get in touch with a reliable and experienced staffing industry and maintain a good relationship with them to get the employees during the peak period of your business. Moreover, getting in contact with so many other employees gives you an opportunity to choose full- time employees from the available temporary workers, when required. Related: What is meant by Staff Augmentation? All in all, Mamsys, one of the IT staffing firms, makes sure to understand the requirements of its clients in order to create an IT staffing model that can specify the ways with which the needs of the organization can be accomplished. The experts, at Mamsys, specify the jobs, positions, and roles that your organization will require in future. The team endeavors to provide efficient staffing solutions. ← What is meant by Staff Augmentation?